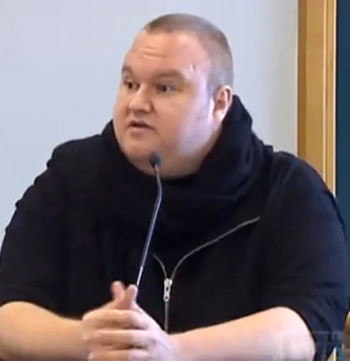 New Zealand-based news channel 3News has released new video footage of the armed raid launched against Kim Dotcom, MegaUpload's former head man. The video was courtesy of an "elite officer" involved in the operation and supports Dotcom's criticism of the "aggressive" raid performed on his $30 million New Zealand mansion. The bust was comprised of about 100 officers, some of which wielded glock handguns and automatic assault weapons like the Colt Commando M4. The initial assault team was swiftly dropped in by helicopter at the front of the home. Moments later, additional forces surrounded the mansion on foot, complete with ground vehicles and canine units. Inside the home were roughly a dozen people: former employees, friends, Dotcom's wife and children. Not knowing what was happening, Dotcom claims he isolated himself inside a large, unlocked room with his hands in the air. His goal, he recollected, was to avoid being shot by startling one of the armed invaders. Once authorities found Dotcom, he purports they applied questionable force, punching him in the face, kneeing his ribs, kicking him to the ground and rupturing one of Dotcom's fingernails by standing on the man's hand. I have to admit, for capturing a non-violent copyright criminal, the show of force sounds quite excessive. During the raid, police managed to seize 18 vehicles and roughly $42 million in suspected ill-gotten gains. Confiscated vehicles included such extravagant makes Maserati, a Lamborghini and Rolls Royce. The Rolls Royce had a license plate that read, "GOD". Regardless of feelings for Kim Dotcom, his truly excessive lifestyle and MegaUpload's supposed "business" model, it does appear authorities overstepped their boundaries. Recently, a New Zealand judge ruled that the warrants given to authorities were too vague to have legally carried out the operation. It also appears New Zealand officers managed to miss their mark of "matching the threat level" of Kim Dotcom and his crew. "We wanted to match the threat level, in this case a low threat with our dress," he added "We made that conscious decision not to wear full tactical kit." The officer also stated that the team's primary objective was to "secure [the] suspect as soon as possible to prevent destruction of evidence". However, according to Dotcom's defense, the FBI had already secured the data they needed at the data center before the raid unfolded. Dotcom insisted, "there was no chance of anyone doing anything to that evidence."